Hi, I and some other members of the norwegean blender community just bougth the URL blender3d.no, and we wondered if we could use the blenderlogo legaly on our website wich will be uploaded soon. Notice that you won’t find that BlenderArtists itself has it own logo and does not use Blender’s. 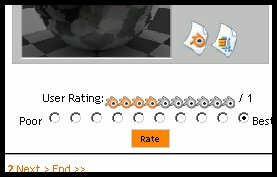 How about you dont use the Logo as a Logo for your Webpage but use it as stars in a rating system? Thats what i plan to. [blendrate.jpg](/uploads/default/original/3X/2/4/24e5d30e05de050807f42e9cc75eac9655764ee7.jpgstc=1&d=1192116039) Is it a better Idea to use something else, or do you guys think its ok to do so. I like the look of it very much, so it would be bothering me to change it, i dont want to get sued though.